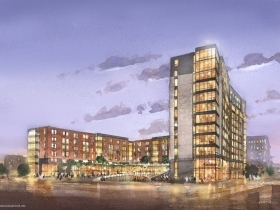 Nearly 1,000 Marquette students will call the complex home starting next year. Wild Hall Construction. Photo by Jeramey Jannene. 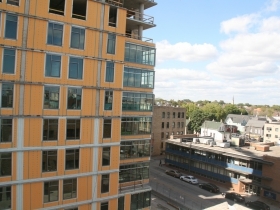 Marquette University continues to reshape their near west side campus in dramatic fashion. 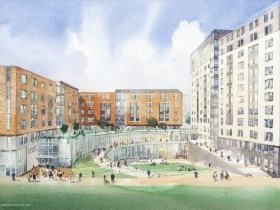 The university is developing a new $108 million, 890-bed residence hall along W. Wells St. between N. 17th and N. 18th streets. 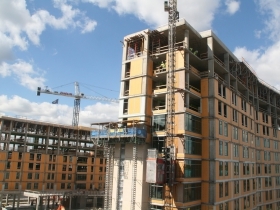 Construction on the two-building complex began in November 2016. 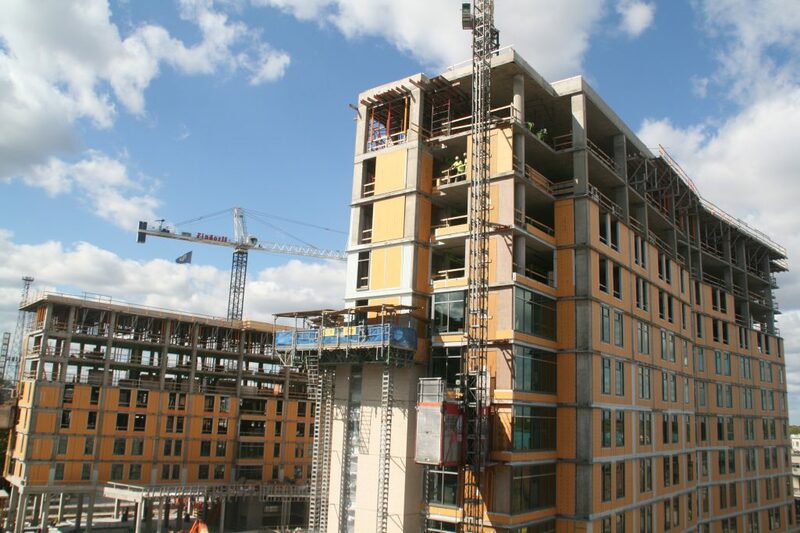 When we first covered the project in early February it was only to be a $96 million, 750-bed residence hall. But within weeks, Marquette announced they’re changing plans, having decided to increase the size of the project to allow the university to evaluate the possibility of closing the nearby O’Donnell Hall. 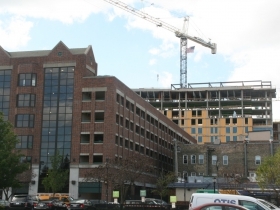 Built along the south side of W. Wells St., the complex will be U-shaped. 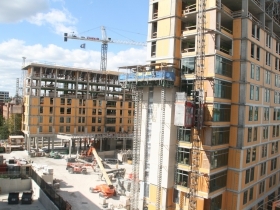 The northeast corner of the site will feature a 12-story tower. That tower, which will front N. 17th St., will connect to a seven-story building which has the bulk of its massing along N. 17th St. 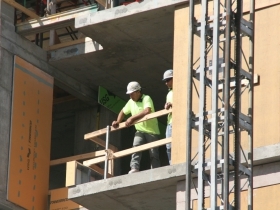 The additional 140 beds will come from adding two floors to the seven-story building along the N. 18th St. 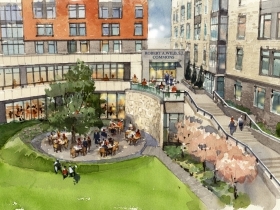 The complex will be named after Marquette chancellor and former president Rev. Robert Wild. The naming decision comes as part of a gift from alumni Ray and Kay Eckstein. The Ecksteins, who previously gave the university’s law school $51 million in 2007, have pledged a $10 million matching gift for the complex’s construction. As part of their matching gift, one of the towers in the new residence hall will be named after the Ecksteins. It won’t be the first building on campus bearing the Eckstein name; the Marquette University Law School is housed in recently completed Eckstein Hall. The Ecksteins also gave a substantial gift to support the development of the Dr. E.J. O’Brien Jesuit Residence. J.H. Findorff & Son Inc. is leading the construction of the project. A partnership between Milwaukee-based Workshop Architects and Baltimore-based Design Collective is guiding the design of the building. The co-ed residence hall is intended to house freshman and sophomore students. 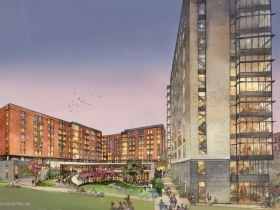 The residence hall will feature pod and suite-like room layouts as opposed to double rooms. Following the opening of the new residence hall the school will begin demolition of the freshman housing facility, McCormick Hall. The new residence hall is planned to open in August 2018, in time for the 2018-19 school year. Construction work is also underway on underground utility lines in the area. According to a release from the university, $5 million is being spent to expand and upgrade pipes that run under the street near the new residence hall and replace deteriorated fiber optic cables that run beneath McCormick Hall. 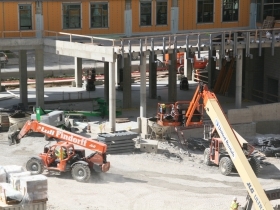 If our construction photos aren’t enough for you, the university has a webcam available to watch the action. Renderings reflect the smaller iteration of the project size. What’s happening with the Wells Fargo building across from the Public Museum? what is the blueprint/ suqare footage of the new dorm rooms in wild tower and do they have private bathrooms or shared, if shared how many students share a bathroom? ?